Think of all the times you’ve allowed a dentist to X-ray your teeth. Reach a certain age, and it doesn’t take long before you lose count completely. Some people get zapped every year or two, simply because the dentist tells them to. But a new study shows what’s really at stake here: People who get X-rayed the most have the highest risk of thyroid cancer. British researchers looking into the rising rates of this unusual condition compared 313 thyroid cancer patients in Kuwait to a similar number of people who didn’t have the disease. Like Britain, Kuwait is experiencing its own thyroid cancer boom. Kuwait also offers free dental care, so those X-rays are there for the taking–and they appear to be taking a toll. The researchers found that patients who’ve received 10 or more dental X-rays have 5.4 times the thyroid cancer risk of those who’ve never been X-rayed by a dentist. Those who’ve had between five and nine dental X-rays had quadruple the risk, and those who’ve had between one and four X-ray sessions had more than double the risk, according to the study in Acta Oncologica. The researchers behind the new study are calling on dentists to stop routine X-rays and stop X-raying patients simply because it’s their first office visit. If you leave it up to your dentist, you’ll get X-rayed every time you walk past his office. So don’t rely on him– rely on yourself, and not just when you visit the dentist, because he’s not the only one trying to zap you. Radiation-based testing, from dental X-rays to CT scans and everything in between, offer doctors so much more than a detailed view of your interior. They offer a quick and often unquestioned route to some of the easiest money in medicine. As a result, Americans have become the most radioactive people on earth–we get half of all advanced medical procedures that involve radiation. On average, Americans now get six times more radiation than we did just a couple of decades ago, according to recent studies. So anytime a doctor or dentist wants to zap you with a radioactive blast, ask him why. Ask about your alternatives. And, more importantly, ask what will happen if you don’t sit down for that test. Sometimes, these tests are necessary–but in most cases, they’re not… and if your doctor’s answers sound a little too much like “I just want to check” or if he uses the word “precautionary,” think twice before you put on that lead apron. 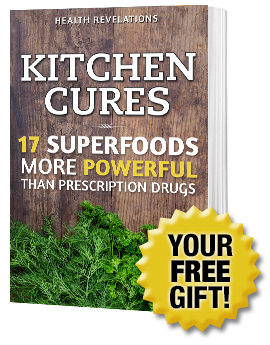 This all-in-one guide is Dr. Stengler’s “cookbook,” containing 17 superfoods more powerful than prescription drugs! All Dr. Stengler asks in return is that you give House Calls (his free natural health e-letter) a try. This is the only time this invaluable report will be offered absolutely free. Simply enter your email address below and we'll send you your free gift. Health Disclaimer! The information provided on this site should not be construed as personal medical advice or instruction. No action should be taken based solely on the contents of this site. Readers should consult appropriate health professionals on any matter relating to their health and well-being. The information and opinions provided here are believed to be accurate and sound, based on the best judgment available to the authors, but readers who fail to consult appropriate health authorities assume the risk of any injuries. The publisher is not responsible for errors or omissions.